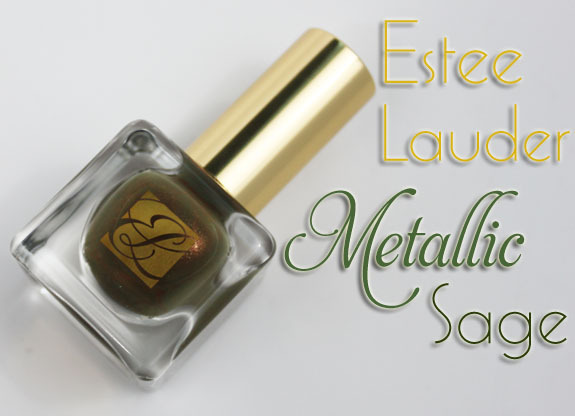 Estee Lauder Metallic Sage Nail Lacquer is part of their limited edition Modern Mercury collection for fall 2011. And MAN you need this color! I know it’s on the expensive side but this is one I can say without hesitation that most nail polish fanatics will regret not owning if they truly love greens. The formula is fantastic. Thick and creamy, smooth and opaque. Just two coats. Perfection in a bottle. Metallic Sage is a murky sage green base with heavy pink, gold and green shimmer. It’s not metallic at all, more shimmery in fact. It’s just amazingly gorgeous and has so much depth. In the bottle it doesn’t look nearly as impressive as on the nail. Just two coats and you have complete coverage. Off the top of my head I can’t think of any dupes just yet but let me know if you think you might know of some and I can do a comparison. I am super pleased I forked over the cash for this one because it was WELL worth it for me. Utterly gorgeous. Availability: Nordstrom and it’s limited edition so get it while you can! What do you think about Metallic Sage? Estee Lauder is my favorite brand for nail polish. I love this color! I will not buy. I will not buy. I will not buy. Reminds me of MAC Style Clan (which I have), but SC is darker & browner with bronzey shimmers. This one looks like it has some green in it. Haha! Kelly, you’re a pro at enabling. My suspicion is that Sass will buy it, too. KEEE-rap, that’s a beautiful color! It’s as though they shot up a Spanish olive with star dust. I LOVE this. Thanks for posting it- I didn’t know it existed! And kudos to Estee Lauder for busting out of the “Granny Makeup” rut! How does it wear? Any chipping? Holy cow I need this color! But, how much do you get for that large price tag? Hmm, maybe I’ll reward myself with one expensive polish as opposed to 3 or 4 that equal the same amount. That is gorgeous! I wonder how it compares to Cult Nails In a Trance? Seriously is Canada ever going to get this in?! I haven’t found it yet and this collection is the first ever Estee Lauder collection to have me SERIOUSLY excited. Love love love that polish! This is a great shade! Since they closed a ton of dept stores when the first recession started, we don’t have anywhere within 200 miles that sells Estee L anymore. That looks like a tiny bottle for $19! Maybe it’s part of a collection of shades??? It’s .3 fl OZ which is the typical Estee bottle size. Oh – thanks VV. It’s looks like a mini bottle. Good to know it’s really full size. This is really gorgeous! I think the color does look similar to BB Couture’s Universal Joint, but the formula on this looks much creamier & more opaque. Wow, I just love all of that beautiful microshimmer-y-ness. This reminds me of a BB couture polish… I think it’s Adam. Do you know how they compare? I think Adam is more of a chocolate brown/green base but I just noticed when searching for my photo of it online that it’s missing from my original post! Something went wrong when I switched hosting companies with some photos. I need to check into it. Yep, I was thinking Adam too! The base colors look quite similar, but hard to tell without seeing them side by side. It’s so pretty! However, the price just kills me especially here in Canada where it’s even more expensive! And the other shade of EL polish I bought doesn’t last very long on me at all which is super disappointing. Your swatches look fantastic though! I think I will regret it if I don’t get it. It looks just way too beautiful to not. You rock it too and that does push me over the edge. Yum-mee! So sad being on a no-buy but once I’m off, I’m gonna get this baby. The pink shimmer and the perfect shade totally make this one a no-brainer for me. It’s kind of a drag that the bottles are only .3 fl oz, at $19– that makes this pricier than most of my polishes which I consider spendy (RBL, Lippman etc, –same $ as Chanel pretty much with the amount) but man, this is a must-have for fall, for me at least! Glad I skipped Peridot, that color, however trendy, is just not me. It’s gorgeous but I doubt I would pay that much for a bottle of polish. I guess I’m too cheap. It looks like it may be similar to RBL Anne. What do you think? This looks similar to one of the Rescue Beauty Lounge polishes from the Tudors collection. Anne, was it? Your photos of this are great! I purchased this one already because it was too gorg to pass up. Great job to Estee Lauder for an original polish! Lovely! I am so torn over this one! I love it but I don’t know that it would look good on me. UGH decisions! Also, this reminds me of BB Couture Adam, although Adam is maybe more brown than green? Or maybe it’s BB Couture Universal Joint I’m thinking of? I’m having trouble thinking off the top of my head, but it reminds me of some BB Couture Men’s nail polish. Yes exactly! BB Couture – Adam! I know Zoya Gemma has a green/blue duochrome, but how does the base colors compare? Drooling, literally. I love it! I have Surreal Violet and it’s the only Estee Lauder polish I I definitely need this! Yay! My name as a polish! is it LE? That’s just like BB Couture – Adam! 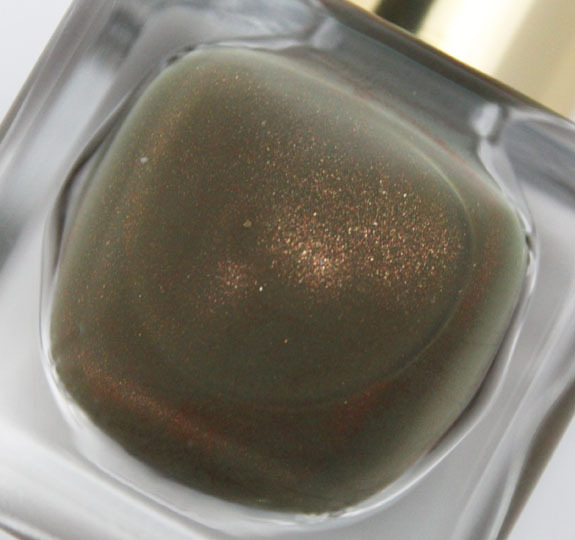 I was thinking maybe Zoya Yara… same gold shimmer, also a dusty green. Man, I was trying to avoid buying this, but looks like I’m headed to Macy’s tomorrow! HOLY FREAKING SHIZZ i need this!!!!! Yara is definitely not a dupe! Wow, I never pay attention to Estee Lauder ,but this…THIS, makes me excited! What an awesome fall color! How similar is this to the new sage green color in the Zoya Smoke and Mirrors collection? It reminds me a LOT of the butter london color i got yesterday. It’s called wallis. Wonder if it is different enough from RBL Anne to own both? Would have loved to see some comparison pictures even though I know that they are not dupes. The colour is too pretty, makes me want to get it! OOOH! I want this shade!